OPI Nail Polish, My Private Jet, NLB59, .50 fl. oz. 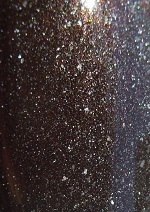 Charcoal/brown nail color with scattered holographic glitter. **Please note: This is *not* the older, linear holographic version. This is new, standard batch that has scattered holographic glitter suspended in the color base. Still a pretty color, but not one of the hard to find, older versions.